Muffin and I left home at 4:30 AM and drove north to find the Dicey's Mill Trailhead which is at the end of Ferncroft Road in the town of Wonalancet, NH. The parking area is next to a field and farmhouse. 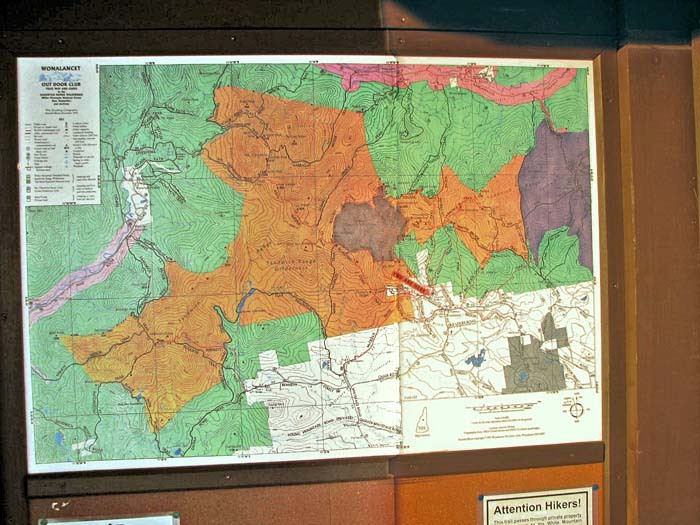 There's a nice map of the Sandwich Range in a kiosk and an outhouse too, which you don't often find at trailheads, especially in the winter. The trail follows the parking lot access lane past the field, where there's a sign for the the Dicey's Mill and Blueberry Ledges Trails. Then it turns right onto Ferncroft Road and follows it the past the farmhouse. The road itself was extremely icy and I slipped and fell once, the only accident of the hike. The trail/road continues past several more homes, one of which had an interesting sign that warned about "No Trespassing with Bear Dogs." I've never seen a sign like it before but I assume that it means that they've had trouble with bear hunters. The trail next enters a driveway and field that belongs to an adjacent farmhouse, where it feels like you're trespassing (at least Muffin wasn't a bear dog). You're not trespassing however, and I remember the last time I hiked the Dicey's Mill Trail, the owners were friendly and said hello. The trail finally enters the woods and soon crosses over into the Sandwich Range Wilderness. I was carrying my snowshoes but hadn't put them on yet as there were still a lot of bare patches. 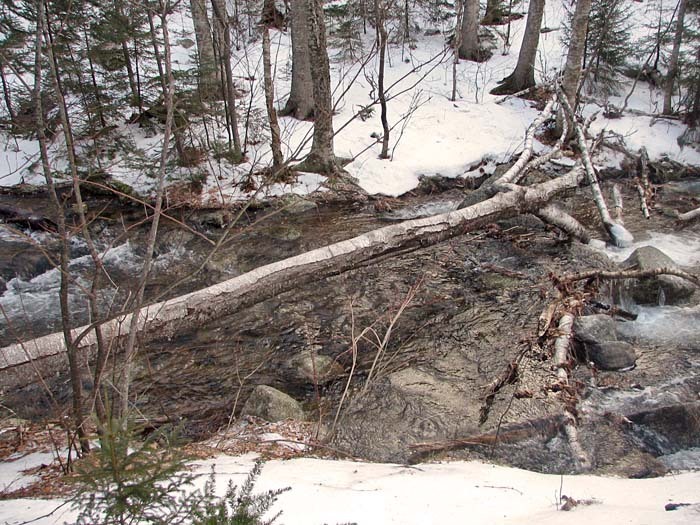 There were a lot of ice too; a number of sections were like frozen streambeds. When the snow cover began to increase with elevation, it was hard and crusty with just a dusting of new snow. This made for easy hiking as there was no chance of postholing. After about a mile, we came to the Wonalancet River, which was running a bit high, covering most of the rocks I'd ordinarily use as stepping stones. Without getting wet, the only decent way across for any distance up or downriver was a fallen tree. Unfortunately, it wasn't large enough in diameter for me to chance walking across; even Muffin would have slipped on its smooth rounded surface. I also couldn't crawl across or straddle it because that way, I'd have no easy way to help Muffin. I finally decided to sit sideways on the log with Muffin next to me, holding onto her with my right hand, and slowly scooted along until we reached the other side. Map kiosk. This Wonalancet Outdoor Club map at the Ferncroft Road parking area shows the Sandwich Range area. Trailhead signs. 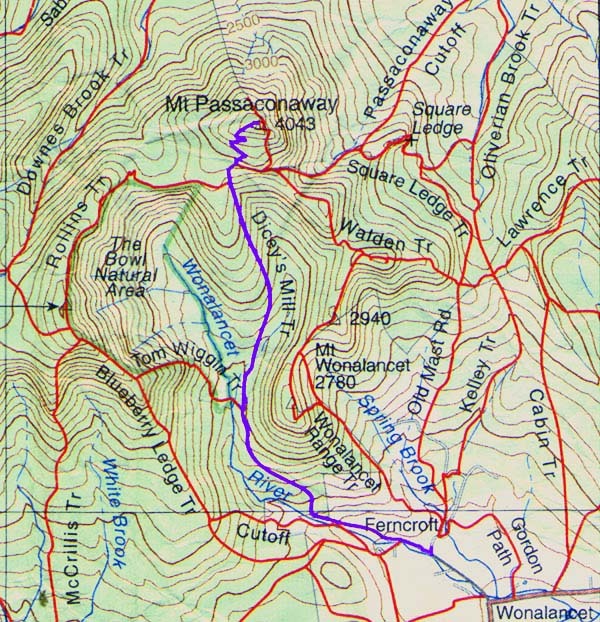 A number of trails leave from the Ferncroft Road area. 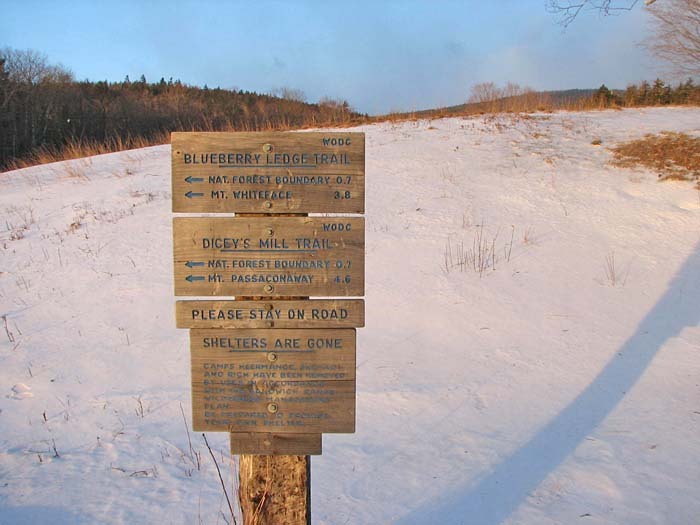 The Blueberry Ledge and Dicey's Mill Trails both start from the west side of the lot. Muffin on the road from the parking lot. 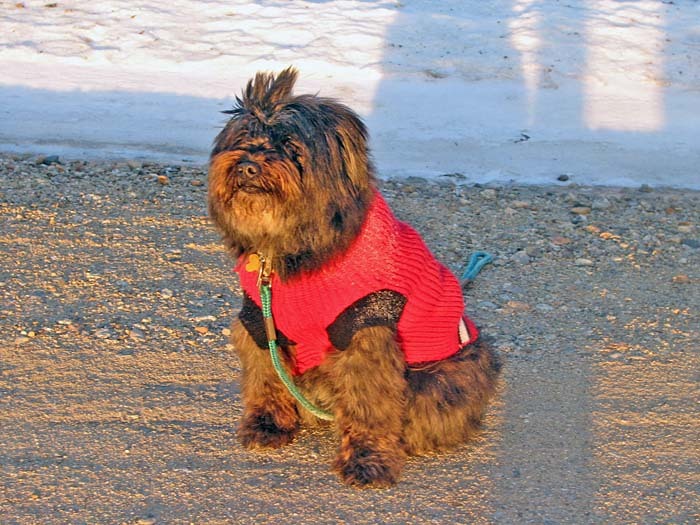 The wind has blown her hair up so that it looks like she has a mohawk. 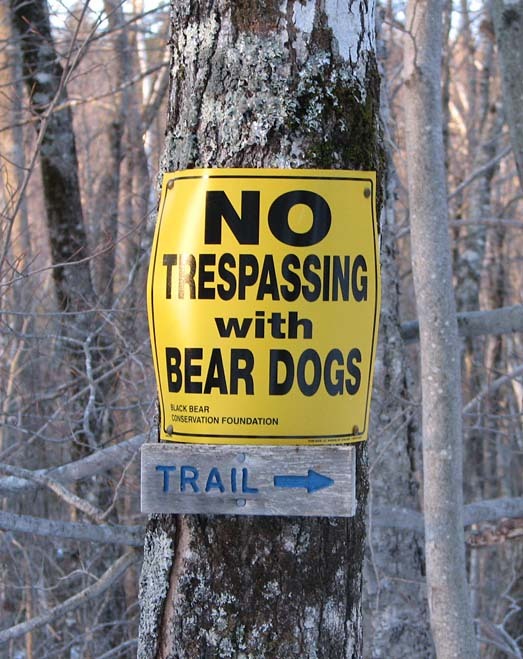 No Trespassing with Bear Dogs sign. This sign was on someone's property along Ferncroft Road. I've never seen one like it before but I assume that it means that they've had trouble with bear hunters. Log bridge. The Wonalancet River was a bit high and we had to cross it over this fallen tree.